Cataract represents an important cause of blindness in developing countries such as Sudan and India, and many of these cases had advanced cataracts and attended lately to the clinical centers. Cataract blindness is considered to be One of the major t public health challenges of the 21st century. Cataract is considered the main cause of blindness in the world, accounting for approximately half (47.8%) of all cases of blindness. In a systematic review of population-based studies, Cataract was the principal cause of blindness in sub-Saharan Africa. It has been accounted that ninety percent of visually impaired people live in developing countries. The blindness The blindness in these countries causes disability and increased mortality, resulting in severe economic and social consequences. In 2002, the WHO reported that blindness involves 37 million people worldwide. This number is predicted to reach 76 million by the year 2020 if efforts are not obtained to deal with this serious health problem. In Sudan, the incidence of cataract blindness in Makah Eye complex hospital was approximately 677.43 patients per year in 2011–2012. In previous studies, there were statistical inconsistencies regarding the prevalence of diseases of the posterior segment of the eye in cataract patients. Significant difference was observed regarding findings associated with cataract across different communities. Shen et al. reported the prevalence of vitreous detachment (VD) in Chinese to be 2.7% in a large cohort study. In an epidemiological study performed by Sawsan and Samira in 2001 at Khartoum, the incidence of vitreous hemorrhage (VH) was reported to be 51.7 due to diabetes mellitus. However, to our knowledge, only rare studies demonstrated the sonographic findings which associate with cataracts. The present study aims to characterize abnormalities associated with cataracts using ultrasonography in Sudanese adults attending AL Walden eye Hospital (Omdurman) and to find a correlation between age and gender with the sonographic findings. However, the present study will highlight the importance of ocular sonographic evaluation in preoperative adult cataract patients. This is useful for ophthalmologists to establish a strategy for diagnosis and treatment for cataract patients and patient counseling. This was a single-center, prospective cross-sectional study for assessment of cataract by ultrasonography and to detect the posterior segment abnormalities of eyes in cataract patients using ultrasound in such preoperative cases. The study was conducted from February to July 2017 in Al Walidain Eye Hospital (Omdurman, Sudan). A total of 102 Sudanese adult preoperative cataract patients (males and females) participated in the study. Exclusion criteria included patients with a history of posterior segment abnormality and those who had a previous history of ocular surgery. Children were also excluded from the study. Data collection sheet was designed to collect demographic data (age, previous surgery, etc.) Clinical history was written from patient's records. The study was approved by the ethical committee of Al-Rebate National University. Informed written consent was obtained from every patient to participate in the study. The patients were scanned using MEDA ultrasonic A/B scanner for ophthalmology Model ODM-2100S with probe of 10 MHz. The method used is directly interviewing the patients when they present to the ultrasound department for ocular ultrasonography. The patient was sitting, flexed his neck, and slightly rotated his head to the opposite side, to prevent gel pouring. The ultrasonic linear probe of 7.5–10 MHz with small footprint transducers was selected and placed over the globe of the eye with a closed lid after application of the gel. The anteroposterior, longitudinal, and transverse views of B-scan along with A-scan were taken. Images were interpreted by an expert sonologist and ophthalmologist. The data collected during the study were stored in a compact disk in a personal computer. The statistical program, SPSS Inc. Version 16.0. Chicago, USA, was utilized to interpret the data. Data were presented as percentage and frequency. Chi-square test was used to evaluate the association between age and gender with sonographic findings of the posterior segment of the eye. P < 0.05 was considered statistically significant. A total of 102 patients with cataract were examined. The mean age was 61 ± 13.87 years; 60 females and 42 males [Figure 1]. The age was categorized into six groups [Table 1]. It was observed that most of the patients were in the age groups of 61–70 years and 51–60 years. Of this total number of patients, 68.6% had no previous history, 10.8% had a history of trauma, 9.8% had diabetes mellitus, and 6.9% had hypertension [Table 2]. Cataracts had been categorized using morphological and etiological classifications such as nuclear and subcapsular cataracts (morphology) and secondary and traumatic cataracts (etiology) as shown in [Table 3]. [Table 4] summarizes the ultrasonographic ocular examinations; it revealed that 77.5% of the patients did not present with any abnormalities in the eye contents, 19.6% had posterior VD (PVD), 0.98% had VD and edema, 0.98% had VH, and 0.98% had VD and staphyloma. 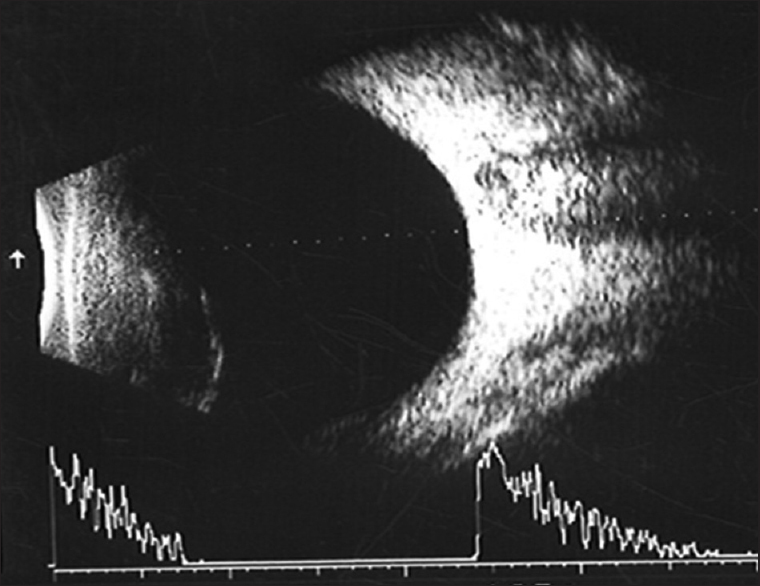 Cataracts in all patients appeared as an ovoid echogenic mass on sonography. 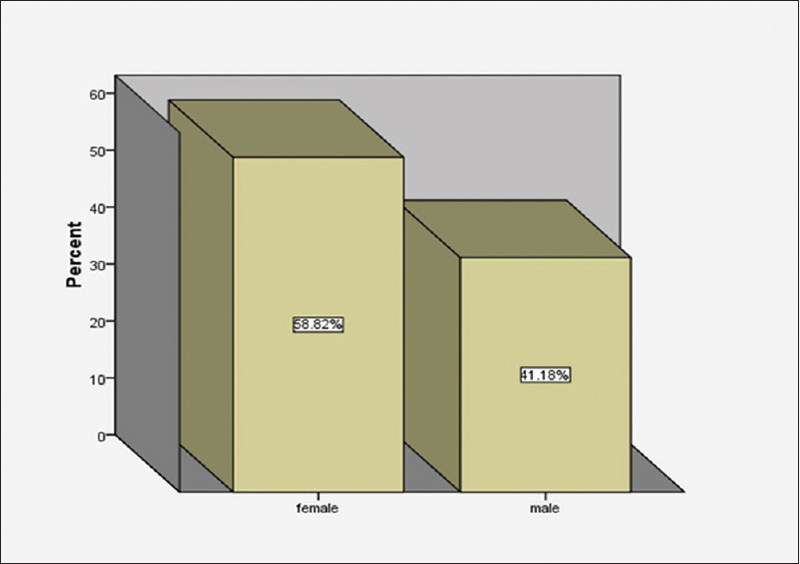 It was observed that gender is a significant factor influencing the incidence of cataracts (P = 0.04). Nuclear and secondary cataracts were more common in females than males [Table 4]. Age is a significant factor affecting the incidence of various types of cataracts (P = 0.001). The age groups 16–70 years and 51–60 years had the high frequency of cataract [Table 5]. [Table 6] shows distribution of types of cataract and age of participants. A statistically significant correlation existed between the types of cataracts and gender (P = 0.04). 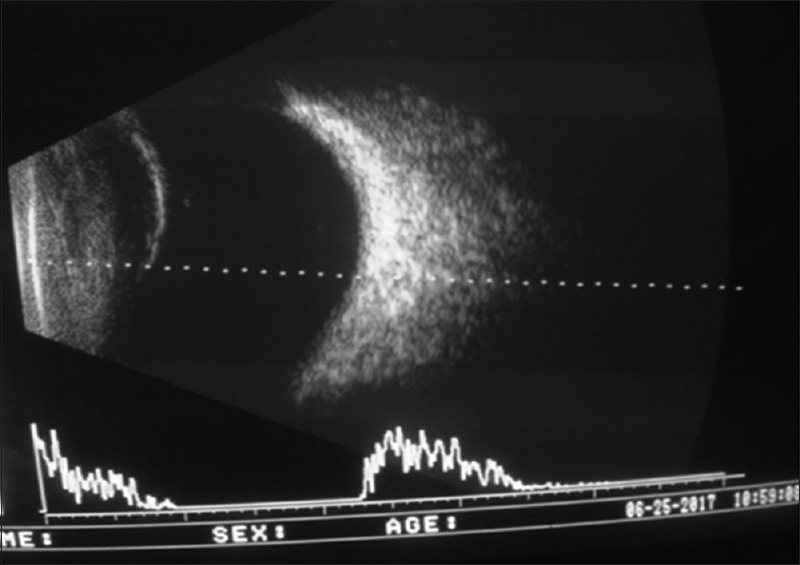 [Figure 2] and [Figure 3] were ocular sonograms demonstrating cataract with vitreous changes. Ultrasonography has greatly advanced in the last 30 years; it has enabled us to study the disorders of the posterior segment of the eye even through opaque media such as dense cataract. It can detect lesions in the anterior segment and most commonly used to assess the abnormalities in the posterior segment of the eye. Ultrasonographic ocular evaluation is often used in cataract patients performed by the sonographers and ophthalmologists in Walidain Eye Hospital and is routinely used in these cases. The sonographic ocular investigations in this study demonstrated that PVD was the most common finding (19.6%). This finding agrees with previous literature, particularly reports related to the prevalence of the various abnormalities assessed with ultrasound. According to Corrêa et al., PVD was the most common finding (26.1%), which is consistent with the current finding. Carrero  reported the prevalence of PVD to be 26.1%, which is close to our finding. It was contradictory to the finding of Mendes et al., who studied sonographic findings in patients with cataract and reported vitreous opacities to be the most common abnormality, 12.1%. PVD is attributed to fluid in the vitreous cavity which passes through holes or tears directly in the retina and separates the retina from the underlying pigmented retinal epithelium. Regarding VH, the incidence was 0.98% in this study. This finding agreed with that of Manzoor and Khalida who reported VH to be 1.91% in nontraumatic cataract patients. A previous study reported that VH was present in 2.5% of the cases, which is closer to our finding. However, VH was less frequent, and it was not a common abnormality in cataract patients. Cataracts were categorized using morphological and etiological classifications. It was observed that all types of cataracts increased with advancing age. The study revealed that nuclear cataract was more frequent than other types of cataracts. This finding was consistent with several published studies. Congdon et al. studied the prevalence of different types of cataracts in an African population and reported that the prevalence of nuclear cataract was more common than other types (15.6%). This result was closer to our finding. It was observed that nuclear cataract was the most common in females. It was observed that secondary cataract is the second frequent type follows nuclear cataract. Similar to this result, Eballé et al. studied the epidemiology of secondary cataract and reported that the incidence was lower than that reported in previous studies. The prevalence of cataract types was significantly different from region to region according to metabolic disorders, age, and ethnic diversity. The results of the present study demonstrated that 36.4% and 26.5% of the patients presented in the age groups of 61–70 and 51–60 years, respectively. It was observed that age was statistically correlated with the type of cataracts (P = 0.001). This finding is similar to other published studies. Haug and Bhisitkul studied “risk factors for retinal detachment following cataract surgery” and reported that younger age is associated with higher risk of retinal detachment. These findings supported that age is an important risk factor for all types of eye cataracts. In this study, diabetes mellitus and hypertension constituted approximately 20% of the presented cases. Both diabetes mellitus and hypertension were regarded risk factors for cataracts. Richter et al. studied the risk factors of various types of cataracts and reported that older age, history of diabetes, and higher systolic blood pressure were risk factors for lens opacities. This supported the fact that age, diabetes mellitus, and hypertension were independent risk factors for cataracts. The current study found that gender is another factor associated with types of cataracts in Sudanese patients. It was observed that females were significantly more frequent to nuclear and secondary cataracts than males (P = 0.04). This finding is consistent with published studies. Richter et al. evaluated the risk factors of various types of cataracts and reported that female gender is one of the independent risk factors for mixed lens opacities. Olafsdottir et al. studied the prevalence of cataract with and without diabetes mellitus and reported that nuclear cataract is more frequent in women. These findings supported our finding that gender is a significant risk factor for nuclear and secondary cataracts. The study faced some limitations. The sample size was not large enough and there were no available referent studies demonstrating the prevalence and sonographic findings of posterior segment of the eye associated with cataract in Sudanese adults. Further studies with suitable sample size would be recommended to confirm the initial results. Abnormalities of the posterior segment are important ocular disorders that should be evaluated before ocular surgery. Age and gender were significant risk factors for all types of cataracts. Ocular sonographic evaluation is an important presurgical step in patients with cataracts or other opacities. Most importantly, the ultrasound also provided useful information for determining ocular surgery since the posterior segment disorders had been identified. Bastawrous A, Dean WH, Sherwin JC. Blindness and visual impairment due to age-related cataract in sub-Saharan Africa: a systematic review of recent population-based studies. Br J Ophthalmol 2013;97:1237-43. World Health Organization. 10 Facts about Blindness and Visual Impairment; 2014. Available from: http://www.who.int/features/factfiles/blindness/en/. [Last accessed on 2017 Oct 01]. Frick KD, Foster A. The magnitude and cost of global blindness: An increasing problem that can be alleviated. Am J Ophthalmol 2003;135:471-6. Gadia H, Awadia G. Assessment of Cataract using Sonography. Master Thesis. Alerbat National University; 2017. p. 1-2. Available from: http://www.repository.ribat.edu.sd/public/uploads/upload/repository/national%20ribat%20university%20Xrey_2625992512.pdf. [Last accessed on 2017 Oct 29]. Bedi DG, Gombos DS, Ng CS, Singh S. Sonography of the eye. AJR Am J Roentgenol 2006;187:1061-72. Agrawal R, Ahirwal S. A study of the role of B-scan ultrasound in posterior segment pathology of an eye. Int J Med Res Rev 2015;3:970-3. Sharma OP. Orbital sonography with its clinicosurgical correlation. Indian J Radiol Imaging 2005;15:537-54. Shen Z, Duan X, Wang F, Wang N, Peng Y, Liu DT, et al. Prevalence and risk factors of posterior vitreous detachment in a Chinese adult population: The Handan eye study. BMC Ophthalmol 2013;13:33. Sawsan E, Samira M. Causes of Vitreous Hemorrhage among Sudanese Patients. The University of Khartoum. Clinical MD Thesis in Ophthalmic Surgery and Medicine; 2003. p. 7-8 Available from: http://www.khartoumspace.uofk.edu/bitstream/handle/123456789/7528/Causes%20of%20vitreous%20haemorrhage.pdf?sequence=1. [Last accessed on 2017 Nov 01]. Qureshi MA, Laghari K. Role of B-scan ultrasonography in pre-operative cataract patients. Int J Health Sci (Qassim) 2010;4:31-7. Corrêa ZM, Goldhardt R, Marcon AS, Marcon IM. Ultrasound findings in patients with dense cataracts. Arq Bras Oftalmol 2002;65:609-13. Carrero JL. Incomplete posterior vitreous detachment: Prevalence and clinical relevance. Am J Ophthalmol 2012;153:497-503. Mendes MH, Betinjane AJ, Cavalcante Ade S, Cheng CT, Kara-José N. Ultrasonographic findings in patients examined in cataract detection-and-treatment campaigns: A retrospective study. Clinics (Sao Paulo) 2009;64:637-40. Wilkinson CP. Interventions for asymptomatic retinal breaks and lattice degeneration for preventing retinal detachment. Cochrane Database Syst Rev 2014;14:CD003170. Manzoor A, Khalida L. Role of B-Scan ultrasonography in pre-operative cataract patients. Int J Health Sci Qassim Univ 2010;4:31-6. Salman A, Parmar P, Vanila CG, Thomas PA, Jesudasan CA. Is ultrasonography essential before surgery in eyes with advanced cataracts? J Postgrad Med 2006;52:19-22. Congdon N, West SK, Buhrmann RR, Kouzis A, Muñoz B, Mkocha H, et al. Prevalence of the different types of age-related cataract in an African population. Invest Ophthalmol Vis Sci 2001;42:2478-82. Eballé AO, Ellong A, Ella GP, Dohvoma VA, Bella AL, Mvogo CE, et al. Secondary cataract: An epidemiologic and clinical survey at the Yaoundé gynaeco-obstetric and paediatric hospital. Clin Ophthalmol 2011;5:847-51. Haug SJ, Bhisitkul RB. Risk factors for retinal detachment following cataract surgery. Curr Opin Ophthalmol 2012;23:7-11. Richter GM, Torres M, Choudhury F, Azen SP, Varma R; Los Angeles Latino Eye Study Group, et al. Risk factors for cortical, nuclear, posterior subcapsular, and mixed lens opacities: The Los Angeles Latino eye study. Ophthalmology 2012;119:547-54. Olafsdottir E, Andersson DK, Stefánsson E. The prevalence of cataract in a population with and without type 2 diabetes mellitus. Acta Ophthalmol 2012;90:334-40.